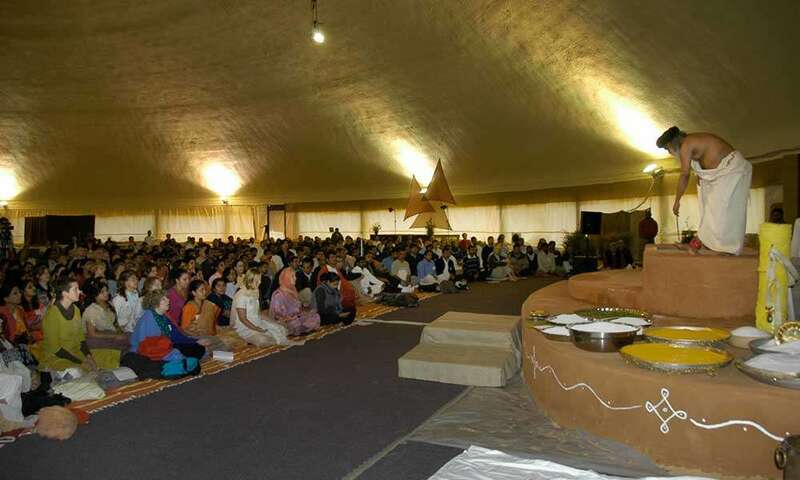 The momentum that has been building for almost three years now swelled to a crescendo on 7 November 2008 when Mahima, the 39,000 square foot meditation hall that will be the center point of the IIIS in the US, was consecrated. The momentum that has been building for almost three years now - since the Tennessee mountain acreage was purchased for the development of the Isha Institute of Inner Sciences - swelled to a crescendo on 7 November 2008 when Mahima, the 39,000 square foot meditation hall that will be the center point of the IIIS in the US, was consecrated. The three-day event, ‘Consecrating the Seat of Grace,' attracted more than 600 participants, as well as an additional 120 guests who attended the concluding ceremony on 8 November. Crisp fall air welcomed guests on the evening of 6 November. Drivers were directed to an almost fairyland-like parking lot, where cars slid carefully in between trees to park atop mounds of soft, damp pine needles. The path to the central complex passes a newly made lake, a small, still pond that reflected the moonlight. Approaching Mahima, one could distinctly smell the soft, sweet, sacred scent of vibhuti in the air - and then suddenly, the trees parted and the dome was there, rising up in the clearing, striking in its magnitude. 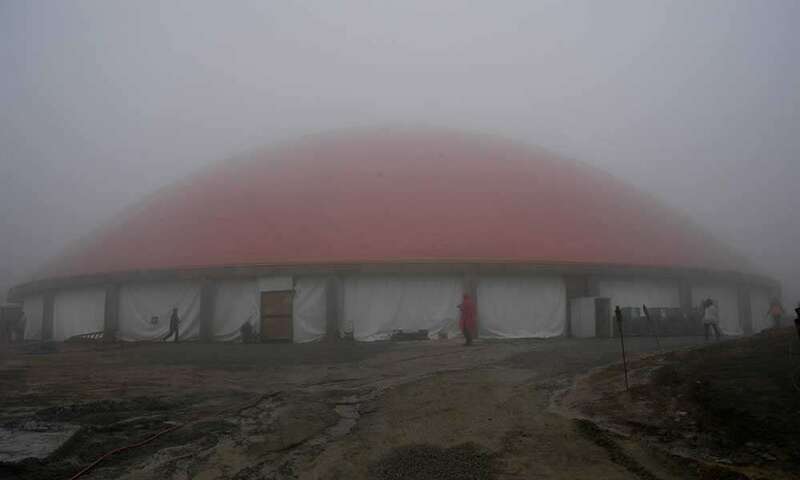 Mahima, a gigantic project that took almost two months and more than two million dollars to complete, is overwhelming in its openness, the ceiling rising to 70 feet and the diameter of the floor space stretching to 225 feet across. Like Spanda Hall at the Isha Yoga Center, there are no interior columns or supports, and the space engulfs the viewer, prompting dumbstruck stares and gaping mouths from those entering for the first time. For those who have visited the Dhyanalinga, the dome-shaped ceiling also elicits a sympathetic resonance that is certainly not coincidental. Buzzing with activity, the dome was a hive of busy volunteers racing to complete the many tasks required before the program's official start early the next morning. A light dinner was served in the dining tent after which many left for nearby hotels, since the lodge capacity at the IIIS was overflowing. Work continued round the clock, and many volunteers did not sleep at all - or lay in their beds for a quick hour of rest, too worked up to sleep. Upon entering the hall just before 5:30 am for the first official guru pooja, two beautiful mandalas gleamed in the darkness, candlelight flickering over the intricate designs of stones, beans, flowers, rice, and leaves. 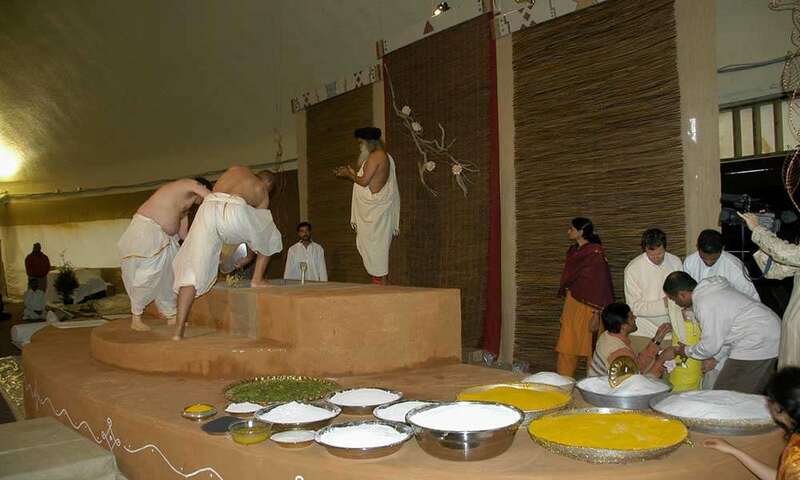 After practices were completed, participants had the chance to change into dressy clothes for the day's special - and as of yet completely unknown - activities. On filing back into the hall at 8:20 am, women were aligned in radial rows on one side of the hall, men on the other, stretching out from the center dais like rays of the sun. 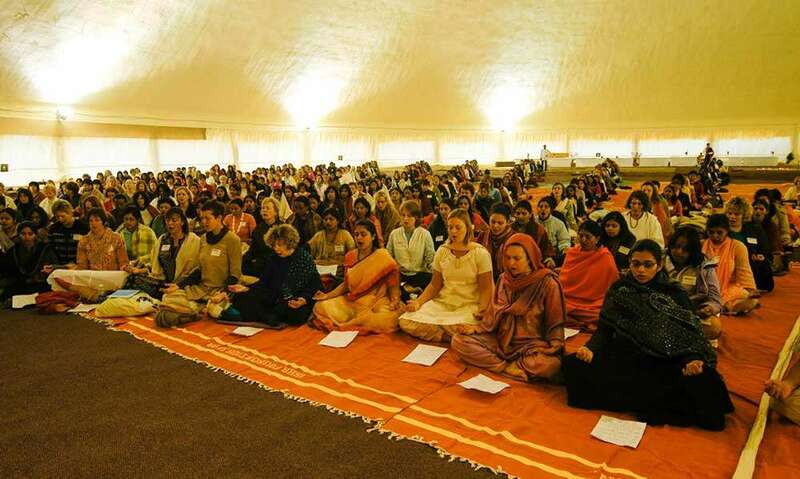 Handouts in Sadhguru's handwriting entitled ‘Sensitizing the Space' were circulated, which contained the lines of a mantra to which participants devoted the morning and part of the afternoon. One meditator, who flew from the UK to be present for the occasion, said of the chanting, "I felt like every word I was uttering was contributing to something big, was actually changing the atmosphere around me. It was so hard for me to finally get up and leave the space; I had to almost tear myself away." Several meditators spoke of the difficulty of chanting the mantra and the resistance they felt - one related that it took most of the day before he was able to dive in and "tears started pouring out of my eyes." Long segments of chanting alternated with segments of sitting in silence, during which time Sadhguru's voice chanted ‘Linga Bhairavi' over the audio system. Participants returned from their second break to find Sadhguru on the dais, already engaged in activity. Many immediately noted his black turban, unstitched cloth wrapped around him, and mystical yet perfectly assured presence. 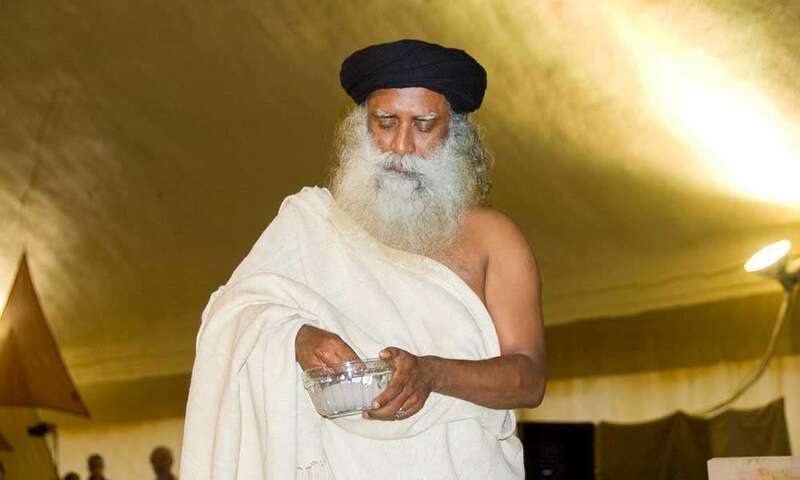 Sadhguru soon began directing a cadre of male meditators, dressed in traditional white Indian panchakachams , who were bringing sand and various other ingredients to the dais. 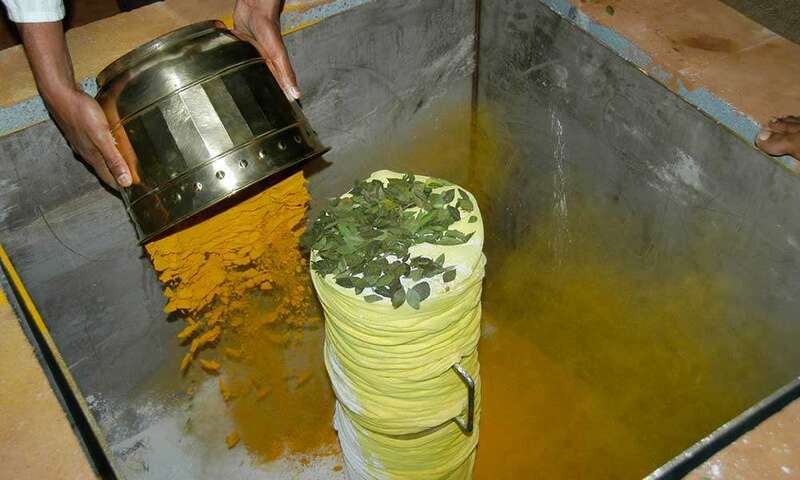 The process continued as Sadhguru combined different ingredients inside an enormous stainless steel box that was lifted and set inside the dais. "I hadn't a clue what was going on but was just mesmerized. I knew it was something absolutely out of this world," shared an awestruck participant. Another said, "Seeing Sadhguru, the mystic, so physically and energetically involved in the alchemy of the consecration was unforgettable." 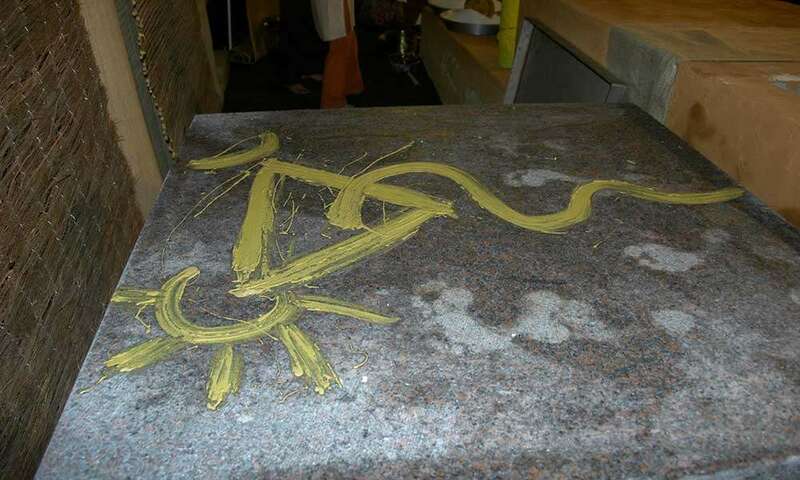 At a certain point, Sadhguru handed a bowl containing a paste to one of the teachers and indicated that participants were to smudge the contents between their eyebrows. An awed participant said, "It was so masterful, the way he conducted himself and the proceedings with such assurance. It was a real honor that he invited us into that space. It felt like he was unfolding a different side of himself." After some time, Sadhguru began chanting a mantra unlike anything those attending had ever heard before. One participant revealed that "when he started chanting that one mantra, it tapped something ancient within me. Something from a completely different time. An undercurrent within me connected with something else that wasn't me anymore. It was a very powerful experience and feeling - really difficult to define - but something very real." Another concurred: "That mantra was really strong… it opened me up and completely connected me into something. Don't know what it was, can't describe it, but it was really powerful." Participants eventually joined in chanting the mantra, and then those who were confident of the phrasing took over the chanting completely. One who kept going said, "There was a point where an overwhelming presence just came over me. I felt completely connected to it because what I was chanting was a part of it. There were a few moments where my whole self was forgotten, I was only the mantra, and it was saying me. Even in my experience it was inexplicable, just a mind-blowing thing." 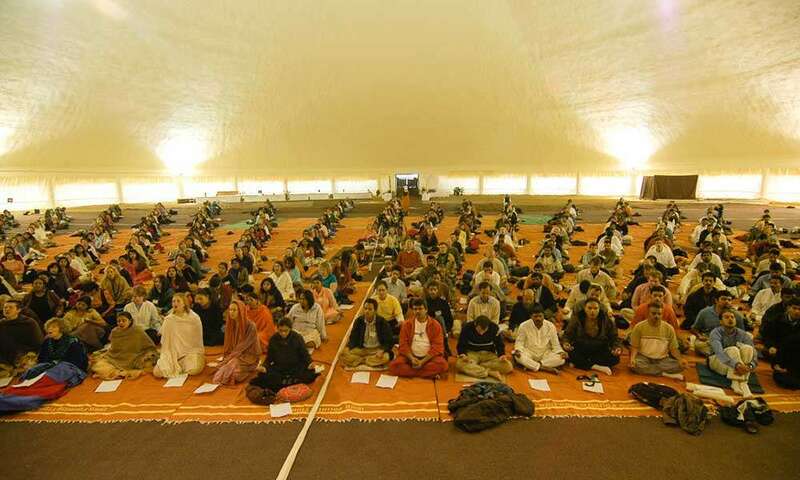 After some time, Sadhguru directed participants to sit with their spines in line with the dais, facing backwards. "When we faced away, it felt like huge energy, so huge I couldn't contain it in my body," a meditator shared. 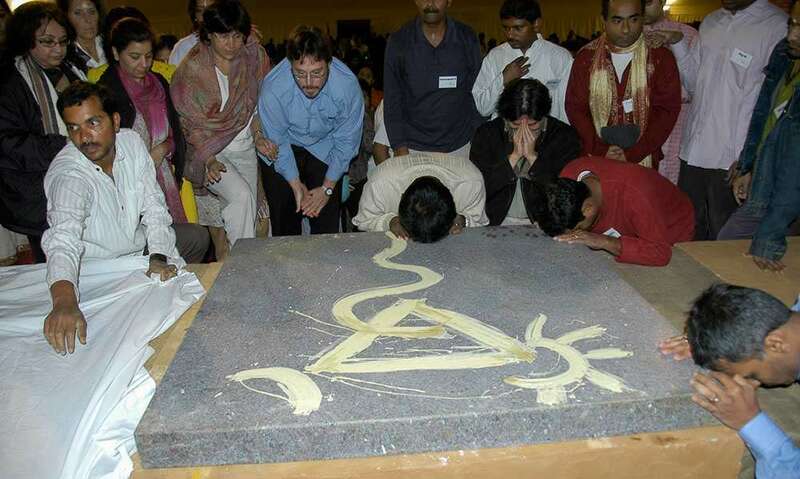 At the end of the process, a large granite stone was set in place over the area in the center of the dais and Sadhguru invited participants to come and touch both the dais and the stone. A line soon formed of reverent participants, eager to come in contact with the newly energized Seat of Grace. After a break, musicians played songs specially created for the occasion, and then all gathered for Sathsang. Sadhguru spoke about the new discoveries he'd made during the most recent Kailash and Manasarovar yatra, making the half-joking disclaimer that it was the weirdest thing he has spoken of until now and that his reputation was on the line. He then acknowledged the political change that had transpired in the US only a few days prior with the presidential election and said, to huge applause, that he thought it was a good week for the US. He clarified that he is certainly not aligned to any political party, nor was he making a political statement, but that, although we may not realize it, America has such a bad reputation worldwide and has begun to redeem itself with this choice. He then moved on to talking about the consecration of Mahima and the nature of its energy - a soft, sweet energy, quite different from that of Spanda Hall. Here, he said, the energy will creep up your spine in a way that will be complimentary to the Shambhavi Maha Mudra offered in Inner Engineering programs, and to the western culture. He addressed the need for us to have a spiritual plan - that we should be planning out at what point we will become full-time spiritual, depending on whether we have children and other factors. And that regardless of whether we live in an ashram or not, we should inhabit our home as if it were an ashram - that it should be a non-exclusive place which we live inside, but do not live for. The next morning after practices, an additional influx of guests were welcomed, beginning with a short concert from the Mahima musicians that ended with everyone on their feet, dancing and clapping and shouting for more. All gathered for a question and answer session with Sadhguru, at which time he explained a bit more about the nature of consecration. "Constantly all around us, one substance is being made into another. This transition and this transformation is happening all the time. If you make mud into food, that's called agriculture. If you make food into a human being, this is called digestion. If you make a human being into mud again, we call this cremation. If you transform the physical into the non-physical, that's called consecration. Why the need to transform the physical into non-physical? Because that's your longing. When you say I want to walk the spiritual path, what you're saying is, I want to touch something which is non-physical." 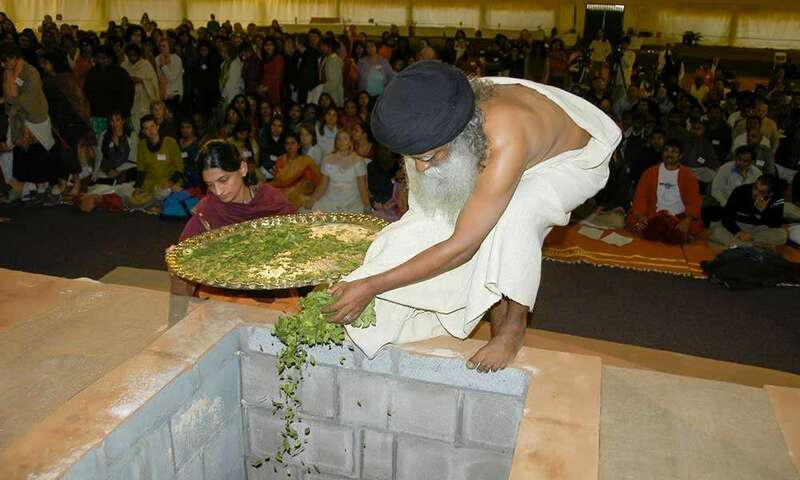 Sadhguru then talked about neo-natal wards and their ability to nurture unformed life. He made the parallel to Mahima, saying that it's like a womb, or an incubator, for spiritual development. After the program was over, many participants remarked on the aptness of the description. "I experienced that it was a sweet, soft, energy while meditating," one meditator shared. One of the residents of IIIS, walking past Mahima the day following consecration, had "an experience of profound silence and stillness that was more than absence, beyond silence, deeper than blackness. At the same time, it was distinctly feminine. And yet so profound and powerful. I noticed that I, too, was being a little more soft and feminine. There was a new lightness in me; I felt I was more discreet, less crass in my movements, more graceful, and more subtle." Everyone present felt that the consecration was the beginning of a new phase, a concrete step towards something enormous. And yet Sadhguru cautioned that it was up to us to determine what we would do with the space and how we would use it - and with the question left unresolved when the event was over, meditators were left to ponder just what each individual would contribute, seek, work for, and let go in order to make Mahima more than a hall, more than a place for spiritual entertainment, more even than a bi-yearly place for Sadhguru to come and hold Sathsangs and basic programs - but a place that will finally hold court to, as Sadhguru has offered, mystical dimensions this part of the world has never seen. Sadhguru speaks about the Linga Bhairavi Consecration during the first Satsang in front of Linga Bhairavi on 9 January 2010.